Greg has over 30 years’ expertise in commercial, local government and private client matters. His commercial legal practice covers a variety of clients including banks and smaller financial institutions, national and private property development and building companies, accountancy, real estate, settlement, and financial advisory businesses. He has extensive experience in assisting local government bodies with a range of issues including governance, statutory compliance, property acquisition and development and infrastructure management. Prior to joining Kott Gunning, Greg was integrally involved in the development of the local government practice at Civic Legal. 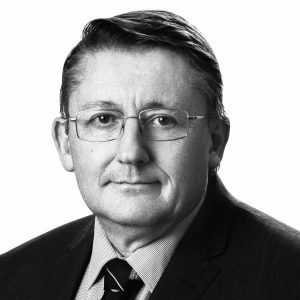 On the private client side, Greg works regularly with individuals across a range of matters including complex business and estate planning, property, wills and administration of deceased estates. Greg maintains a strong association with the provision of community legal services and for 8 years between 1992 and 2001 worked with the Law Society of Western Australia to establish and manage the Law Society’s community legal services including Law Access pro bono referral service and the Shopfront Lawyer, and managed other community projects such as the Litigation Assistance Fund, Law Week and the Francis Burt Law Education Centre.